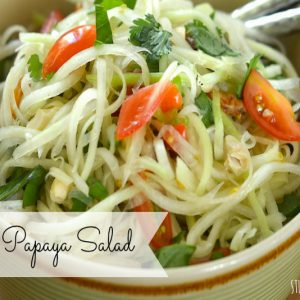 Green Papaya Salad will have all the flavors of savory, spicy, sour and a little sweet combined duking it out on your tongue. Peel the papaya with a sharp knife. Julienne the flesh using a julienne peeler (as I did) or use a box grater to achieve a similar effect. Juice the limes and pour over the veggies. Hint: Roll your limes on the counter prior to squeezing to help release the juice. Add fish sauce, coconut aminos and (optional) a drizzle of honey. If you prefer, add the dried shrimp and then let sit for 30 min for all the flavors to meld. Garnish with chopped cashews and cilantro prior to serving. Serve straight up or as a delicious side dish to grilled chicken or fish. Enjoy the taste-circus that’s about to happen in your mouth!